Four boxes arrived at both my Florida and L.A. studios full of a new product I had yet to come across: CheeCha Potato Puffs. Before tasting anything I wanted to be sure of the product’s adherence to gluten-free standards. I was immediately assured that the four products are all manufactured on a dedicated GF line and also batch-tested to ensure no cross-contamination. Okay, so now I’m safe to open the bag and bite into my first Sea Salt & Vinegar CheeCha Potato Puff. Wow, this is the perfect substitute for the deep-fried salt and vinegar chips I’m so fond of, especially on a hot and muggy Florida afternoon. The “puffs” are light, airy, no oils—just baked. Next the Sea Salt & Spiced Pepper. These have just the right combination of spice, the lime reminded me of Mexican treats I’ve tasted, and the plain was not my favorite but my testers enjoyed it and reminded me they go very well with any dip. I was told Mediterranean Ginger is coming soon. The company is family-owned. The concept started in 1996 when low-fat healthy snacks were starting to rise in demand and popularity and a family member had a serious heart attack, alerting the family to the need to change their diets. Initially CheeCha Potato Puffs were not GF and contained MSG, but a willingness to listen to customers’ feedback and needs led them to change their seasoning line, resulting in this current GF and MSG-free line. I was told they continue to learn and improve by listening to their customers and welcome all feedback. The chips are extremely light, can be used as a dipping chip or eaten alone, and the shape is playfully designed similar to a wheel. Kids and adults will enjoy. That’s wonderful how they got rid of the MSG in this product. I hope that in the future this ingredient will disappear in the U.S. I’m glad that not only this is MSG-free but that CheeCha listens to their customer feedback. Definitely a good sign! These are sooo delicious! I like ALL their flavors and the salt and vinegar chips are perfect for the summers here in Alabama! I haven’t been able to find them in our town, but I just order them online. Several months ago, a friend let me try some of these, and they were so good that I went ahead and ordered them online. I love these! My celiac daughter brought them home one day after spending the day at her celiac friend’s house and I was like, “What are these?? ?” I was embarrassed to find that I ate almost all of them, so I went out and got more. Well, now I buy a bag every week! Oh I love these! I totally forgot about them and saw the picture and remembered that my hubby brought a bag home over a year ago I think. I meant to buy some again but forgot the name. This isn’t the first time this has happened that I’ve come across a long-forgotten but much-appreciated gluten free treat. Thanks! 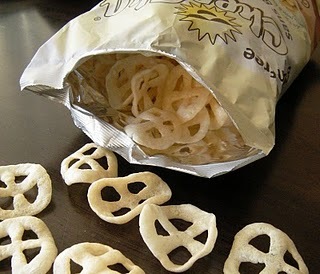 I want to try these CheeCha Potato Puffs so bad! I haven’t been able to find them around here but they look and sound delicious! Thank you for another gluten free snack! The information I read from Tina Turbin’s website is amazing! Now I want to try these even more! I have subscribed to the newsletter and heard about the contest thru Facebook. 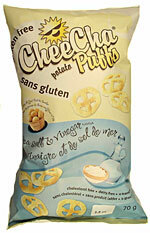 These look great for the gluten free diet and I am happy to see that they are MSG free. The sea salt and vinegar sound amazing! Would love to try them! So happy to hear that gluten free snacks taste good! I am tired of the same old gf snacks and let’s be honest…some of them taste like cardboard! Healthy is even better!! Thanks for this review!!! I want to try these CheeCha Potato Puffs, they look delicious. I heard about this contest through a search engine. I subscribed to your newlsletter. these sound like something my GF 2 year old would love! These sound great…I hope I win.